Samsung UE65JU7000 review | What Hi-Fi? The Samsung UE65JU7000 is the first of the Korean company’s 2015 TVs to enter our test rooms and we're suitably impressed. A great (and) big 4K picture, a revamped smart interface and a stylish design: this is a seriously tempting proposition. We’re finally starting to see more 4K content on the market, and so it seems rude not to start there. We begin with Amazon Prime Instant Video and an episode of Bosch, and the picture performance is rather splendid. It’s sharp and detailed. Given that there are over eight million pixels you might think we’re stating the obvious, but this is a level of sharpness born of clarity and strong definition. It’s a precise, revealing picture. Textures are cleanly drawn, but not etched and artificial. Once the picture is properly calibrated, we like the colours. They’re beautifully judged. What you get is a natural palette with enough vibrancy to hold your attention, but not enough to approach a psychedelic nightmare. That being said, we think Samsung may have kicked it up a notch from last year’s sets, which have been accused of being a little understated in this respect. Contrast is strong. Let’s start with the blacks: it’s not the kind of abyssal darkness you’ll find on OLED screens (or, indeed, the plasmas of old), but it’s convincing enough that you won’t have a problem with the black bars top and bottom. Whites are brilliant – but not exaggeratedly so. Highlights never produce glare, nor do they threaten to wash out their surroundings. At both ends of the spectrum, there are clear differentiations between the various shades. Speaking of which, shading is nicely executed. It’s subtle, with a masterly approach to the nuances of contours. Combine that with the picture’s dynamism and definition and you have yourself a convincing sense of depth. Flying picture quality, then – and most of it holds true when we take it down to 1080p Full HD. We serve up a Blu-ray of Interstellar and the Samsung demonstrates largely the same properties. Granted, there is the expected step down in outright sharpness and detail, but the difference is subtle. Freeview HD broadcast doesn’t fare quite so well, with a pinch of grain. Nonetheless, it remains a solid, precise picture. This TV is an adept upscaler, and has no problem filling those 65 inches. A note on 3D: this set doesn’t include 3D glasses, but we’ve asked Samsung for some. We’ll update this review as soon as they arrive. We take it right down to standard definition with a DVD of The Grand Budapest Hotel and we’re met with inevitable picture noise. There’s no getting past the massive amount of scaling the TV has to do. And a Freeview broadcast, as we would expect, is softer and grainier still. The Samsung makes a valiant effort, however. It’s still a perfectly watchable image. Colours remain balanced, with as much clarity and definition as you could reasonably expect. An impressive picture indeed – and we’re pleased to see Samsung has worked at the sound as well. Ever since TVs started dieting, sound quality has suffered. But this set has no interest in being size zero, which is perhaps the reason the sound is rather good. It’s suitably weighty, which we don’t tend to expect from flat screens. Tonal balance is good, resisting the temptation to go shrill whenever somebody talks. We’re also impressed by the tall and widespread scale of the sound. Of course, a TV’s internal speakers cannot match a good pair of speakers, but today we don’t feel compelled to advocate soundbars. Good sound and picture isn’t enough these days, so let’s talk about the features. Or rather, one big feature: Tizen. This is Samsung’s own open-source platform, which will drive its smart TV operating system this year. Essentially, this means a new, streamlined look. Gone is the separate Smart Hub page, replaced by something that bears a striking resemblance to LG’s WebOS platform. That’s not necessarily a bad thing. What you get is an unobtrusive (or less obtrusive) pop-up bar, where you’ll find recent and recommended content. Apps and channels are lined up in colourful little tiles, and you select or organise them using the motion-sensitive pointer remote. The system encourages you to multitask with content from different inputs. Flicking from broadcast TV to HDMI1 to YouTube is made as easy as switching channels. And when you leave an app, you’ll return to where you left off: no more automatic shut-downs. New to the party is the Multi-Link, which lets you split the screen into TV and app. You can now watch TV while engaging in your Twitter feed, if you’re so inclined. You can even change the sizes of these separate windows. Samsung has traditionally been king when it comes to app offerings. Past TVs have offered the full suite of the free UK catch-up services, along with Netflix, Amazon Instant Video. Not all of these were present on our review sample, but Samsung assures us they will become available shortly. We like the new design, but it’s not particularly snappy. We experienced a noticeable amount of lag between button presses and completed actions. While it’s not disastrous by any means, it’s something we hope can be fixed by a firmware update. Now, a word on the TV’s design. It’s a nice-looking unit. There’s a good deal of metal in the frame and stand. We dig the minimalist, slightly futuristic vibe. The problem, however, is Samsung’s perpetual obsession with making screens that appear to float. The TV is supported by a single thin column, which is not particularly rigid. It’s certainly strong enough to hold the screen up, but there will be a worrying wobble should you knock into it. Samsung, we’d like something a little less precarious, please. At least there is a way to avoid having to squeeze around the back. Samsung provides a One Connect mini box, which houses most of the TV’s connections. Your HDMI cables plug into this box, which then connects to the set with a single cable. The box is small enough that you could keep it out next to the rest of your kit. Unlike the One Connect box provided with other Samsung 4K Ultra HD models, this mini version can't be used for future upgrades. Oh, and remotes. As is now the norm, there are two controllers: a traditional one and a fancy one. The traditional one looks boring but is a functional and reliable button stick. The smart one has been redesigned to stop resembling a small mango – it’s now a banana with the ends chopped off. Some of us think it’s now a little thin and unsubstantial. 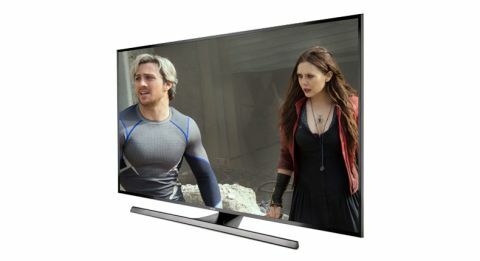 The Samsung UE65JU7000 is a very good TV. It has its flaws, but overall we are suitably impressed, and we think you will be, too. This is an excellent first step for Samsung in 2015, and we can’t wait to see what else the company has lined up.